Glaucoma affects an estimated three million people in the United States, and an estimated 300,00 new cases are diagnosed each year. 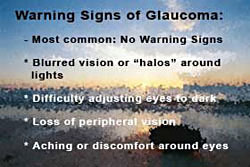 Glaucoma is a leading cause of blindness in the United States. Each year, approximately 5,400 Americans go blind from glaucoma. Once vision is lost to glaucoma, it is lost forever. Glaucoma is a group of eye illnesses characterized by damage to the optic nerve. Generally what occurs is the pressure within the eye gets too high. This pressure damages the optic nerve that carries visual information back to the brain. It generally attacks side or peripheral vision first: Therefore, it is possible to have 20/20 eyesight and still have glaucoma. Slow and gradual loss of peripheral vision generally goes unnoticed until large areas have been lost. The most common type of this disease primary open-angle glaucoma, which most often strikes people over the age of 50. However, there are types which affect infants and children. People at a higher risk are the elderly, blood relatives (especially parent or sibling) of glaucoma sufferers, African-Americans, diabetics, and nearsighted people. Fortunately, glaucoma is a treatable disease. Although there is no known cure, as yet, the symptoms can be controlled with laser treatment or medical management so the patient can enjoy a lifetime of vision. But the problem must be identified early in order to prevent loss of vision. New laser treatment have been developed which are very effect in treating glaucoma. One simple laser treatment may control glaucoma for 6 to 10 years. The laser is basically pain free and only takes about 5 minutes to perform. Once the laser treatment is done, many patients do not need to use their glaucoma eye drops. In addition, many new medications have been developed that are more effective in treating glaucoma and usually only have to be taken once a day. These types of drops make it much easier on a patient to consistently use their drops. Significant advancements have been made in the early detection of glaucoma. We now have simple test that can detect glaucoma many years prior to it causing any symptoms or damage to your eye. The tests are painless and only take a few minutes to perform. Today, our ability to detect, track and treat glaucoma have made this once scary eye disease manageable. The only problem is patients are unaware they have glaucoma until it is too late. 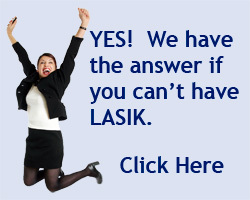 The key is having an eye exam and being tested prior to having your vision damaged.